Self Defining What You Can Still Do with an MFA in Fine Art. The essay below was originally written and published in August of 2012. I felt that writing this was my responsibility as an artist, art educator, and MFA advisor to many students. It was and continues to be the most read and shared post on my blog. The reason why? I feel that it gives my regular audience and far beyond that the most use value. 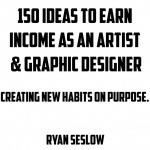 I am re-publishing the original post here along with links to my newest project: “150 Ideas to Earn Income as an Artist & Graphic Designer.” The new e-book is an evolved fragment of this essay. It serves as a metaphor as well as an ongoing series of synchronicity based experiences. After hearing a pattern of complaints from both recent graduates and current candidates about what one can do with an MFA in fine art I decided to become a part of the answer to the question. “What can I do with my MFA?” I began working on this as a blog post, but it has turned into much more. The purpose of this information is to activate awareness, creative solutions, and a change of consciousness about what one can do with the seemingly elusive terminal degree. I also want to help you understand what YOU can do as an MFA degree holder rather than what you may have expected it to do for you. This puts you in a position of empowerment to be able to CHOOSE what you will create next. This post will function as an expanding work in progress as the comments and feedback will take on their own life. I will later consolidate a “best of” section to help narrow down your search for answers. Please add to this thread and take from it what you will. Share it with those who “pop into your mind” as you read it. *Note, this is not a forum to banter, and bash the MFA and or where you went to school to receive one. This is a place to take responsibility for where you are at this moment, and how to make a new commitment by making full use of your existing skills and talents. This information is not only meant for MFA candidates and recipients, those who hold other art related degrees can also benefit from reading this. As well as those with a passion for creativity, design and art in general. I am writing this from my own personal perspective, and from the experiences that I have had and continue to make manifest. It is my intention to activate and stimulate you into action through this post. As a terminal degree, the MFA gives those who obtain it the entry-level credential to begin teaching at the college level. I believe that this perk is attractive to those who may wish to teach college level immediately or even down the line. You do not need to revise this credential, as your MFA is valid for life. This is exactly what attracted me to the degree. I was 29 years old when I began my MFA program. I felt confident in my studio practice as a working and exhibiting artist. I felt that I had a very clear objective goal about obtaining an MFA for the purpose of college level studio art teaching. This in many ways was a limitation as I reflect back now because I became to the outcome. I am content admitting that at the age of 29 I was a very immature artist and young man. I was driven mostly by my ego, and its perception of “what is prestigious for an artist at that age.” I know it seems funny now almost ten years later. I am so happy to say I was wrong! My MFA program has made me a far better overall communicator than I had ever considered. Sure, at the time I thought I may begin to understand my work better, and I may also be exposed to some new things, but that too was an enormous limitation that I had created, and fed to my expanding ego at the time. I was wrong, I learned a thousand times more than I imagined. So, what were those things? What will I learn in an MFA program? During my first semester as an MFA student I clearly began to understand that my attitude towards my program and myself was everything. I repeat this, YOUR ATTITUDE is everything! This was not only awareness, but also a choice! This was crucial. I cannot stress enough how important it is to FEEL GOOD about yourself in relationship to everything that you set out to do. Self-confidence plays a big role in much of what we will do in this world. Begin by asking yourself, how do you feel about yourself, your work, and being open to learning new things? How open are you to creative criticism? I personally did not wait for anything to be handed to me in my program; I began by making clear and objective lists of what I wanted to learn and what the outcomes would be. Everyone should be doing this on a yearly basis. Knowing what you want out of your program is essential to meet your learning goals. If you do not know what you want, then simply begin by making a list of what you “do not want” you can then turn that do not want list into a “do want” list by changing the way you have phrased the “do not want” list items (I will show you an exercise on this later.) I myself revised those lists as the procedure became more and more clear through the list building process itself. We can call the “want” lists “learning goals.” Through the variety of courses and approaches that I was exposed to I discovered that the MFA is an open sourced degree program, the individual candidate has the power to co-create their experience and what skills are needed to improve and evolve. Not only you’re actual studio work, but your mind-set and attitude towards your practice as well. Practice, meaning your art making practice, you’re thinking practice, your organization of content practice, your speaking and asserting practice, and your self-promotion and marketing practice. As well as anything else that you have included in your personal list of leaning goals. 1. I wanted to learn how to critically analyze my work. This included my pre-existing MFA program work as well as my current and developing concept related works to be. Obtaining critical thinking skills was of great interest to me. Through a variety of art history classes and seminar courses I was exposed to a ton of new content, vocabulary, artists, and ways to think about what I was experiencing. I loved the one on one sessions with MFA professors who became advisers that I personally selected, this greatly helped me along in my process. Advisers would generally come to my studio space for 1-2 hours every other week to discuss what I was working on. I would also e-mail them in between sessions for advice if necessary. The repetition of this individual practice for four semesters over two years really helped me learn how to talk about my work and assert myself confidently. I also took the time to get to know the professors that I was working with. I made an effort to get to know them. I interviewed each and every one of them about who they were, and what they were doing with their own work. I asked them what worked for them, and what did not. This created contrasts to my own process and I took notes, many notes! These people became a part of my network, and I still today keep in contact with each and every one of them. They have become instrumental in connecting me to new people and opportunities. Again, I made the effort to get to know them. I learned at this time, one must learn how to ask for what they need. I learned that learning to ask was also a skill that I had to work on. If you do not ask, you may never know, and with out the proper communication, one is left to make assumptions that may in fact become false perceptions and later false beliefs. We also by choice believe the things that we believe. (re-read that last statement) When was the last time that you actually questioned one of your long-term beliefs about something? Especially if it is an area of your life that has not changed in over 5-10 years? Hmmm. 2. I wanted to better understand and analyze the works of other artists. This included my classmates, professors, and the works that I was exposed to in various formats (films, museums, galleries, books, magazines, websites, etc.) Again, I made a very conscious effort to get to know my professors, classmates and fellow students. I reached out to them. I proposed and collaborated on projects with them. I became very inquisitive to gain contrasts, insights, and new awareness. I suggest you do the same. I started doing studio visits with my classmates and I followed the same format my one on one advisers were using on me. This put me in their shoes, this helped me assume the “being” state that I had as a goal, which was to become a college level professor. Notice, I did not wait until I graduated to begin feeling this way, and experiencing myself in that role. I took action while in process and became that state of mind both mentally, and internally. I created a feeling while I was doing those studio visits, and it was one of enthusiasm and excitement. It transcended directly into my teaching presence and practice today. I found these experiences to be the most rewarding. I frequently visited museums and galleries as well, but in most cases these experiences were much more subjective as the artist was not always on hand to question. But then again, one could also make a museum or gallery visit with a friend, classmate or colleague to evoke a discussion. 3. I wanted to understand how to apply and synthesize those critical thinking skills into and out of every related topic that we covered. I wanted to then evaluate and apply it to non-art related topics to see how those retained skills and experiences would transcend, if they did, and how they did. Micro testing the information also greatly held my interest and still does today. This was and still is one of the most rewarding aspects of my program. I had a shift in consciousness. I became aware of how to inspect and think about almost everything differently. I found similarities and resonance between many seemingly new things. I found that I could transcend the use of my vocabulary, and mold it into a new concept and idea. It could be both fictional and non-fictional. The idea is that I was experiencing the world in a new way. If you think about, this is one of the most traditional roles of any artist, to show others how to see this world that we live in, but in a new and unique way. 4. I wanted to learn how to effectively and efficiently communicate my thoughts, feelings, concepts and philosophies through my work. I also wanted to learn how to communicate through the written and spoken word. I wanted to learn an array of research methods that would become the mapping formula for me to archive. It is important to know and understand how we learn and retain what we learn. If we do not make a conscious choice to do this, we may lose information to our short-term memory. I find that organizing my thoughts in a written format is very helpful because I see that process as a series of steps. Even if the content is image or video based, when it follows some form of order, I can understand it in a chronological way. When I have developed this order I find it easier to turn an idea or series of them into an understandable tangible thing like a drawing, painting, print, or sculpture. This also helps me speak about my work as well in a presentation format. My mid-semester and final MFA group critiques, art history and seminar classes demanded verbal presentations each semester, this forced me to dedicate my time to building a better format for presenting, speaking, and reacting. I was able to experiment with several different formats of presenting. I created image based power point presentations, as well short documentaries based on the subject matter I had been given. I created a method to present directly from my own web site and well as using other sites and their functionalities as a method. After four semesters of that, I took fragments of each one of those to create a very efficient process. I change it up every so often and continue to work on it today. 5. I wanted to develop the discipline and commitment skills to a concept and a body of work that would ultimately manifest a final thesis project. This would help me later taken on larger projects with confidence, as my two years of committed work in the program would prevail. The final MFA thesis format for me was a great thing in and of itself. It helped me really make a deep commitment to one idea, and to stick with that idea in both a written and art object production way. It helped me build content, edit it, re-add things, gain insight from others, make more edits and ultimately create something from scratch in every way shape and form. 6. I wanted to learn new and improved studio techniques and how to synthesize them together. Frequent time spent in the studio was a big part of this process. I made time out of my already busy schedule to focus on my development. I wanted to master at least three or four techniques that I could later produce and market. I focused on drawing, acrylic painting, metal sculpture, installation art, video art and printmaking. I worked on several other things but these practices really helped me develop a confidence in each medium. The result has evolved into bodies of work today that I could not even consider at the time, but it was through the dedicated practice that cultivated where I am now. 1. I understand how to respond to and analyze works of art. 2. I understand how to apply critical thinking skills and various methods of art criticism. 3. My program provided interaction and exposure to multidisciplinary sources of artistic expression and perception. I understand how to independently discover such content and transcend it into usable subject matter. 4. I understand that exposure through viewing works of art in various formats induce and evoke new methods of research. 5. I understand how the social, political, and cultural influences of art can alter, develop, and expand my self-growth as an artist and a human being. 6. I understand how content presents an understanding of time surrounding major artistic movements. 7. I understand the process and benefit of how to retain specialized knowledge about a particular artist, work of art, or art movement through research of his/her life and work. 8. I understand that dedication and commitment is crucial for regular studio practice. 9. I understand that this list goes on as I take the time to reflect on these retained outcomes specifically. I suggest that you will do the same. Note- I have not included the direct learning outcomes from my studio practice as my MFA concentration was in Sculpture. Although my outcomes may show compliments and similarities to your own area of focus, they may also be contradictory. As an MFA candidate or graduate, I am sure that the studio practice aspect of your program was or is very strong. I have Graduated, What do I do now? This is the best part. First and foremost your level of confidence should be very high, as you have accomplished something very important! A degree completion is a milestone in your life. It takes dedication, hard work and a lot of openness correct? Do you remember the physical feeling that you had as you walked across the stage to accept your degree? It was an intense feeling of excitement and happiness right? That is exactly the feeling that you want to evoke each and every time that you set out to do anything in your life. Fuel each and every thought and dream that you have with that feeling, it is crucial to understand that! Make all of your intentions out of love, excitement, passion and enthusiasm! Do not ever set a goal or desire out of NEED or lack, this is crucial because negative energy will reach the recipient of whom you are trying to contact internally before it reaches them externally, often causing a big “NO” as the answer. The purpose of the various commitment based thinking, speaking, creating, and action taking skills learned during your program has in fact prepared you to be the CREATOR of what you DECIDE to DO NEXT. What do you want? Will you CHOOSE it? If that statement seems like a lot of POWER, IT IS! It is YOUR power! I don’t think that a lot of people realize this. You have or have had 2-3 years of site on scene practice to assume this new role. You now can prove it to yourself by applying it. It is YOU who will decide and choose to be who you are in relationship to what you chose to create next. So again, what do you want to do? What are your intentions? What ideas do you have? Who and what is your target market? What actions do you need to take to get started? You must choose to know each and every one of these things. Please know there are a multitude of things that you can create and do as an MFA degree holder, and to let out a little secret, this blog post is the short version of a book that I am currently working on. The book will include interviews and case studies to help in the process, but for now lets consider some of these things that can help you get started. I get asked this question a lot. I am the same go getting pro-active enthusiastic about life guy that I was when I began my MFA program. I love being an artist and an art educator but I am not attached to these two things. I am always working on myself. I consciously choose to expand my career by integrating other areas of interest. Business, technology, writing, spirituality, and developing a brand are just a few of those things. I think it is important for people to know that being attached to an outcome out of need will only push it further and further away from you. That kind of energy signal tells this very creative and vast universe that you will only settle for one outcome, and that blocks many other potentials that you will not be able to see, hear, feel or smell! So dream big, but dream without attachment! This allows for the “HOW” things will happen to be the greatest surprise. I will talk more about this idea later. I am a working and exhibiting artist as well as a full-time adjunct college level professor. I use “full-time adjunct college professor” in a different context of the normal full-time tenured professor. I am not tenured, but my workload certainly exceeds the full-time teaching workload standards. Understand, that this is all my CHOICE. For the last eight years I have been teaching between 7 & 9 various studio art courses each semester simultaneously between the same four colleges here in the NYC area. I teach 2-3 courses over each summer and take 8 weeks off from teaching each year. I supplement my income by doing many other things during and in between teaching. Here is a list of what I have done, and continue to do today outside of teaching. Please understand that my BFA and MFA programs have taught me many of the skills that I have organized to develop the new work opportunities listed here below. This is a growing list that keeps me inspired and creating new ideas. Please note, this list does not include traditionally approaching galleries, museums, or other related spaces to show your work. I will post another essay on that in the near future. Guest/visiting artist lecture and speaking opportunities: As a teaching or working artist (or both) you can give presentations about your work. Lectures can be 1 hour in length by using a power-point presentation format and then commence with a Question and Answer period after. A one-time fee is paid by the host/patron/establishment. These short lectures will usually pay a minimum of $150 and up to $1000 at some universities or special events. Please do not dismiss this idea. I know several artists who do this several times per year on a regular basis. Local College undergraduate and graduate level art programs, high school and junior high school art programs, public libraries, and community centers. 1. Build a power point presentation with high-resolution images that show a time line of your various works and how they have evolved. Include a variety of mediums, exhibitions, collaborative projects, and commissioned works. One hour in length will suffice. 3. Using the internet you can easily create a list of the local colleges, universities, high schools, junior high schools, and public libraries in your area, research who the department chair / program director is, (you may have to call by phone to get this info) and contact them by e-mail or phone. Follow up 3 weeks later with another e-mail. Also, you may let your potential host know that you would be willing to come in and meet with them. Visiting Artist Residency Program: Develop a residency based workshop or project that can be created site on scene with a college/ high school or junior high school’s art students. Projects can teach new techniques with demonstrations, as well as implement them into site-specific projects; specifically, Mural projects work well as they demand longer durations of time to complete. High Schools and Junior high schools in your surrounding area, or public libraries sometimes will accept mural proposals by an artist or as a community participation endeavor. Host a weekend workshop: for teaching artists & creatives on “how-to techniques” or with an emphasis on “collaborating with other artists” (just to name two ideas) The workshop can be held on a Saturday & Sunday, 2-4 times per year. The venues/hosts could vary. (public libraries, community centers, continuing education centers, your own studio, or one of a friend’s studios) The outcome of the workshop will help artists raise awareness about new techniques and practices as well as building a new body of work while working directly with other artists. 2. Find a venue to host the event. This could be your studio, or a friend’s studio, or a private or public studio space in the area, public libraries, community centers, continuing education centers. Clearly discuss the fee and come to an agreement. 3. Develop a syllabus of what can and will be taught. Think of a niche like water based method silk-screen print-making, mono-printmaking with rubber stamps, or rubber mold making for sculpture ( to name a few, what is your specialty?) Create a clear estimate of what the student fee will be. 4. Draft up a proto-type information flyer. Promotion and marketing can easily be done over social media and through your local town newspaper. The promotion should be done 4-6 months in advance to secure all details. Host a one-day workshop: with an emphasis that teaches teaching artists ( think of junior high or high school art teachers) “A new how-to technique” with an emphasis on projects and skills that they do not have or currently use in the classroom. (you will have to research this and find out by contacting one of the school’s art teachers) The techniques can later be implemented as “a workshop site on scene” with the students as well. 1. Create a standardized e-mail that introduces yourself, briefly explains your current experience, and proposes the opportunity. Ask the host what the venue pays for such a presentation and how to proceed. Suggest having a meeting in person with the host. Be sure to have an idea or technique in mind along with a written proposal, as it will most likely be requested. Also, have an estimate of what your material costs will be to execute the workshop. Ideas #5, 6, & 7 are dependent on basic graphic design skills with adobe photoshop, illustrator, InDesign, & wordpress. In today’s day and age I cannot stress how USEFUL the knowledge of these software applications are for any artist. Please trust me on this. You need basic design skills. In most cases you can find free video instruction on all of the software listed above, but if you prefer, and I do suggest that you can also take an online course. http://www.lynda.com/ is one of my favorites for sure. Graphic Design Service: with an emphasis on Logo Design or Re-design for existing businesses. Businesses need image makeovers and updating. Be the one to provide this service. 3. Research and create a list of your local business to contact by using the web as well as visiting your town’s chamber of commerce. 4. Deliver the flyer/post cards by hand to the business owners. You can do a few at a time; most towns have several businesses. During your visit, ask for an existing business card to retain, later you can inspect it and offer a better design solution through a follow-up e-mail. Graphic Design Services: with an Emphasis on Blog Design. Blogs can and are used for many different things today, you can show a potential patron “how” by creating one for them. 1. Design a simple flyer/post card that offers the service, as well as a web page or blog that resembles the marketing on the flyer. The promotion should offer a one-time fee, and the promotion should state the additional usage and features of the new blog and how it will help promote their business, product, service or interests. You can also offer to moderate and maintain the blog for the customer at an additional cost. their business card for a follow up e-mail. If you can have a conversation with the owner by all means engage! Create and develop an online product: NEWYAWK T-shirts is a brand that I created in the 1990’s. It has evolved into several formats. My emphasis is on selling the brand as t-shirt designs and limited edition prints from my web site and blogs ( http://newyawkteeshirts.com & https://ryanseslow.com ) What might you sell online? It’s easier to set up than you think. My target market for the NEWYAWK brand includes: New Yorkers, NY lovers, NY transplants, Tourists, people between the ages of 13-45. Online teaching/Remote teaching: Online College programs are growing fast, several existing colleges are also adapting to offer art courses online to keep up with this changing trend. With an MFA or in some cases even an MA you can teach online courses. Online courses can range from 4-6 weeks at a time or as regular semester 15-week courses. Some are even more flexible than this. 1. Do an Internet search for colleges and universities that offer online or remote education programs for art. This will be the majority of the leg work, but you will be surprised as to how many there are. A lot of this opportunity is in graphic design, web related design, communication arts, and art history, but I am noticing an upgrade to art appreciation, and traditional studio courses like drawing, painting, sculpture, and printmaking. NOW is actually a good time to get affiliated and connected to these building programs because they are in their infancy. They are seeking people who will help develop and build these kinds of courses and programs. 2. Send e-mail based letters of inquiry and attach your current CV to the schools that you are interested in teaching for. Follow up 3-4 weeks later. This is a repeat process at least 2-3 times per year with the same, as well as new schools. You must be persistent. Host an annual POP up Gallery: in your studio space or in a friend’s studio. Cut out the traditional gallery percentage, dealer fee and anyone else looking to get a cut off the sale of your work. You can sell direct with this idea. This is a time where you can personally invite perspective and potential patrons of your work to come for a visit by invitation. Make a list of those people and contact them by invitation. Send it out by e-mail and social media. The trick is, to set this up way in advance, and then have your artist friends help you spread the word. Information the same way. Once the marketing has been spread, it is helpful to engage with your contacts about the event, get them excited, and get them to spread the word more than once. Doing this at least 4-6 weeks in advance will secure a solid promotion and turn out. This is actually a lot easier to plane than you may think. If a solo show seems difficult, or if you feel that you do not have enough work, collaborate with one or two other artists! Social Media Art Auction: Hopefully by now, you understand the power and reach of social media? If not, as an artist, you should! (more on this later) Simply select a piece of your work, and post it to your profile or feed with the auctions instructions. I have used this exact phrasing: “Friends, I am running a special artist to collector Auction today and tomorrow on this painting (or work of art) here is how it works, private message me if you are interested and make your bid. (Serious people only) The bidding price starts at your offer. This painting (piece) will be sold to the highest bidder. The bidding starts now (insert date, time, & time zone and will end by insert date, time, & time zone) If you want the piece to be picked up, indicate “You must also be willing to pick up the painting tomorrow” (insert date, time, & time zone) my studio is located (insert town or city.) Also, describe the work (The painting is acrylic on 1/2 ” plywood. 3.5 feet high X 2 feet wide.) Give this a try once or twice a month and see what happens. Share this with all of your contacts and ask them to share it as well! Your social media contacts on Facebook, wordpress, twitter, tumbler, LinkedIn, and any other network. I have done this with Facebook and twitter and have had good results. I would not suggest trying to auction off many things at once, but to really pin point making a specific sale and emphasizing a selected piece. I am grateful for your comments below. 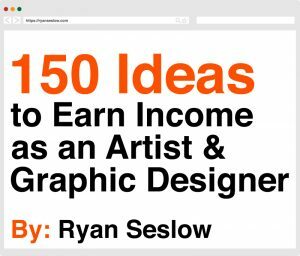 150 Ideas to Earn Income as an Artist & Graphic Designer, The E-Book. Creating New Habits on Purpose.